By Loud Crow Interactive Inc. Seller: Loud Crow Interactive Inc.
© Loud Crow Interactive Inc. 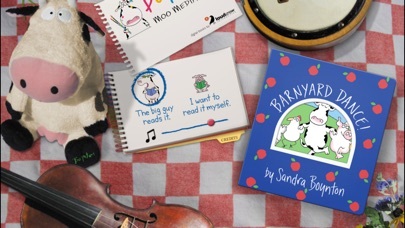 I have purchased many many interactive books for my 1 year old and the Sandra Boynton books are by far the best I've found! My daughter loves them, as do my special education students. Great job! The app has no volume on ipad...it does now! The app does not have any volume or sound on the ipad. This is why we purchased the app so it can read to our kids. Please provide a fix for the ipad. It would be 5 stars if there is a fix for the sound....Update...there is sound. Went to app support and found out it was my mute button. AWESOME! 5 stars it is for a great app! This app is fantastic! Lots of interactive play for kids (dragging, spinning, and moving animals, touching to make animal sounds) that is cute and interesting without being cumbersome. My 20 month old twins love it and it also keeps the interest and attention of my 4 year old. 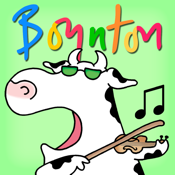 I have owned this and the other Boynton apps for several years and love them. This most recent incarnation of all of the books has no sound, however. I don't know what is going on, but it isn't much fun to play with/read without the sound. Please fix it!! My kids love the Boynton book apps. I'm sure this will be fixed soon but we were really disappointed that it was released in this condition. It App crashes at the opening page. I've deleted and reinstalled several times as well was performing hard restarts of my iPad. We own all of the previous Boynton/Loud Crow collaborative titles and have thoroughly enjoyed each. This one is no exception. Our three and four year old kids love the story and exploring each page. This is yet another fine app, and well worth the price. 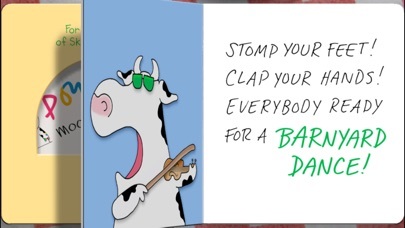 A Hoot and a Moo and a Cockle doodle Doo! 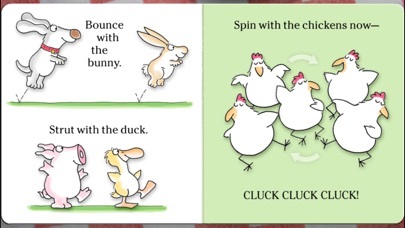 This is my grandson's favorite bedtime story, in part, because we all join in the reading of the traditional board book version and do the dance and mimic the animals. I couldn't imagine how you could improve on our version - but this is totally Fantastic! I have never seen an interactive book that meshed the music so well with the reading of the book. The song was amazing and the timing truly artfully done. It took us awhile to find all the interactive parts - we were too busy doing it our own way. What a delight! Your animal actions are beautifully thought out. I know this will be a long time family favorite. You have enriched American bedtime culture! Thank you! Great app! I love the interactive activities. Easy to use. I was trying to find something like a monster at the end of this book. Interactive and engaging. This is not that. It is okay for a one year old, but it doesn't really do much. It really is like just reading the book with banjo music playing in the background. If your child loves the board book I would recommend but that is it. I wish there was a way to look through these books without buying them to see if they are an appropriate age for your child. I won't be buying anymore book apps for awhile without a lite version. Fun for children 1-99! I have fun playing this to my grandchildren ages 1and 11. The animation is great and easy for little hands to figure out how to make things happen. Brings a smile every time. I have had no problems with this app. No crashing at all. My biggest problem is trying to pry the iPad away from my "almost" 18-month old when it's time to move on to something new! :-) Great App! The sound doesn't work at all, with repeated downloads and a google search on how to fix, no results. No fun with no music or sound. Waste of money. We have two other digital Boynton books which are great, but this one will not open! I have deleted the app and re-installed, as well as rebooting my iPad as support suggested, but still no luck! I hope this gets resolved soon! We have had the app for two weeks now but haven't been able to use it at all. Works perfect on my iPhone 4 with OS 5. Great narrator and nice animations. My 15-month-old loves this interactive book. We've read it several times and there's still plenty left for him to explore. It's nice to see an app that is well designed and finished. There is lots for kids to do. It adds content to these well loved books. My 7 year old loves doing these with my 2 year old. I'm a music teacher who uses a curriculum that specifically calls for this book. I was so excited to find a version I could use on my iPad. But the whole reboot thing doesn't work so now I have an app I can't use. Please give us an update ASAP so that this app isn't a waste of money. My 14 month old loves this--and so does momma!! This is her favorite book, so it is fun to watch her dance to the beat and see the excitement in her eyes when she makes the animals move and make sounds. Just perfect! My 18 month old loves this. He has the hardback book, but this is much more entertaining. I also had the NO SOUND issue after installing. I found that the iPad Side Switch (next to the volume controls on the top/bottom) was set to selective mute, which mutes the ringer, notifications, and some game sounds. The switch has two positions. Setting it so that the orange dot is not visible allowed the book to play sounds. Also, even if the switch is set with the orange dot visible, the sounds played through the headphone jack. My 3y/o son LOVES it! Is always asking to "play my book on the ipad!" Hope we can get all her books on here and they're just as good! Great app. I love it and my kid hasn't even tried it yet! It works on my friend's iPad. So, we showed it to my 2 year old. I just tried installing it, and all the same crashes everyone else reports. This is so disappointing. No sound. There is no point to buying this app without the sound. My Sons Favorite Author comes to LIFE! Pure fun. I recommend all the Sandra Boynton book apps. Keep kids entertained when you need a moment to breathe. My sons find new little fun things the pages do even now. 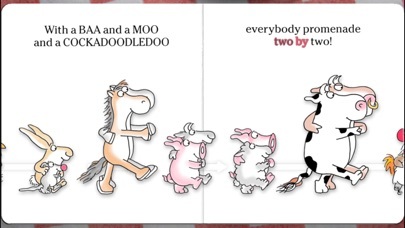 Love all Sandra Boynton books and this is so adorable! Thanks for a good job! One of the very best interactive books out there for preschoolers. Fun, beautiful illustrations and classic Boynton humor. All of her books on iPad are great - bought them all! After buying this and other Boynton apps, my child refers to his Boynton books as being broken because nothing responds. We have all of the Boynton apps and were thrilled when this one was released. After many attempts with loading it onto the iPad as well as the iPod Touch, it just won't open. We are very disappointed, but I see we aren't alone. I hope they resolve the issue quickly. I got a new iPhone and this is the first app I downloaded, even before I set up my email and voice mail. We have the book in two board book sizes as well as the plastic one for bath time...we can't be without the book! So, this app is a life saver when you're driving and the kid is screaming in the backseat. Pull over and hand them the iPhone! You'll literally have the world's smallest violin playing in your back seat. It's amazing, sometimes I find myself playing it when I get handed my phone back. loaded with action, fingers and mind busy fun ! Would give no stars, app will not open at all. Really disappointed my daughter since we have been waiting for this to come out for quite some time. I love this book because it makes funny animations! HIGHLY recommend for little children! Kids will love making the barn animals walk,jump,and spin around! Guess what I am 9 and I love the book ! I thought this might be for just little kids but my 8 year old grandson was having a ball. He and two cohorts, ages five and six, were dancing, clapping and stomping their feet. This is a gem! GS pretended he was playing a fiddle. What a good memory for me. I too have tried rebooting, reinstalling and still no luck. I loved this book as a board book, but it's much better as an app. The sound and animations are wonderful and are lots of fun for kids and parents. Updated! Thanks for the fix. Opens on the iPhone and iPad now. My daughter loves the original books but loves how the digital ones come to life. My daughter and I can't wait for more of the boynton books to come to life digitally. Really love the other Boynton apps, but this one just doesn't work - I've yet to even see what comes after the splash screen. Hopefully a fix will come quickly. A favorite now even better! 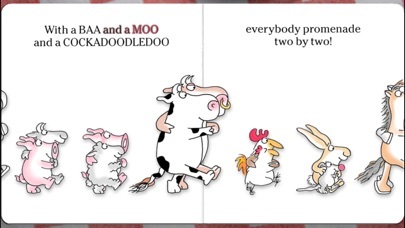 I've always sung this book to my daycare children and grandchildren and they dance right along with it. Now it is interactive and they can sing along and make deeper connections to words and their meaning! What an engaging, wonderful book!